China F-35: Secrets Stolen From US Show Up in Its Stealth Fighter. China obtained F-35 secrets through an extensive cyber spy operation carried out in 2007 against U.S. defense contractor Lockheed Martin, U.S. officials and defense analysts said, and they have shown up China’s new stealth fighter jet. Codenamed Operation Byzantine Hades, the multiyear cyber-espionage operation yielded sensitive technology about the United States’ latest fighter jet which in turn was incorporated into the development of China’s new J-20 fighter, the Washington Times reported. According to Defense officials, a Chinese military unit known as the Technical Reconnaissance Bureau (TRF), located in the nation’s Chengdu province, was behind the cyber-espionage. Once the data had been acquired, the TRF is said to have transferred it to the state-run Aviation Industry Corp. of China, which then used that stolen data in building the J-20 fighter jet, the Washington Free Beaconreported. Having started 10 years ago, the F-35 development program is a joint venture between Lockheed Martin and the Pentagon that has cost $392 billion, making it the Pentagon’s most expensive weapons program ever. The program’s original price tag was $233 billion; however it ballooned due to delays brought on by cost overruns. Referred to as a “fifth-generation” warplane, the F-35 fighter jet will be replacing the popular F-16 and more than a dozen other warplanes that are currently in use by the United States and foreign governments around the world. As of late 2013, the U.S. partner countries of Britain, Canada, Australia, Norway, the Netherlands, Italy, Turkey and Denmark, Israel, and Japan have already ordered F-35 fighter jets from Lockheed Martin. Also known as the Joint Strike Fighter, the F-35 is said to be the most technically-advanced plane in the United States’ arsenal with 7.5 million lines of computer code controlling its weapons system, which is triple the amount of coding currently used in the top Air Force fighter, the Government Accountability Office told The Wall Street Journal. In addition to the apparent cyber theft of secrets pertaining to the F-35’s development, China has also reportedly accessed other U.S. weapons systems, including the Patriot missile system, Terminal High Altitude Area Defense, and the Army’s ballistic missile interceptor program. Report: US Press Freedom Declines Under Obama. Freedom of the press in the United States has plunged during the Obama administration, according to the 2014 Reporters Without Borders World Press Freedom Index. “The U.S. under President Obama, who once promised to run the ‘most transparent’ administration in the country’s history, fell from 32nd to 46th in the 2014 World Press Freedom Index, a drop of 13 slots,” The Washington Times reports. The report reviews the state of media freedoms in 180 countries. Major declines occurred in the United States, the Central African Republic, and Guatemala, while marked improvements took place in Ecuador, Bolivia, and South Africa, according to the index compiled by the press advocacy group. Finland, the Netherlands, and Norway continue to lead the index for press freedoms and government openness, while Turkmenistan, North Korea and Eritrea “continue to be the biggest information black holes, again occupying the last three positions.” Syria also ranked near the bottom. The rating was based on seven criteria: the level of abuses, the extent of pluralism, media independence, the environment and self-censorship, the legislative framework, transparency, and infrastructure, according to Reporters Without Borders Secretary-General Christophe Deloire. “It makes governments face their responsibilities by providing civil society with an objective measure, and provides international bodies with a good governance indicator to guide their decisions,” Deloire said in a statement. The report cited the handling of three events as major contributors to the declining rating for reporter freedoms the United States, according to The Washington Times. • The Justice Department’s handling of a probe of The Associated Press and other media organizations suspected of receiving leaked data. Freedom of the press is increasingly under siege as governments around the globe are targeting journalists — to get to their sources and those people who leak sensitive information, according to the report. 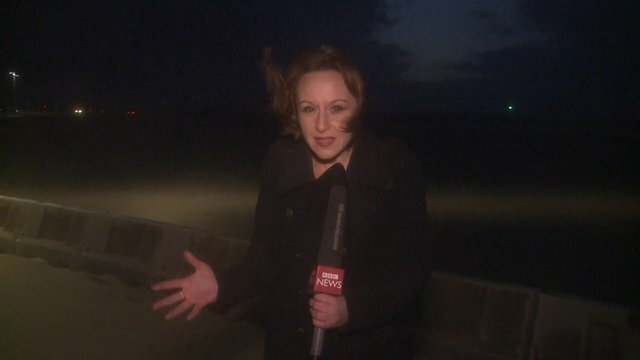 European storm and tidal surge cause evacuations and travel chaos. Dozens of flights were cancelled or delayed in the Netherlands, Germany and Scotland, while rail services were shut down in several countries. One of Europe’s longest bridges – connecting Sweden to Denmark – closed. Tens of thousands of homes were also left without power as the storm hit. 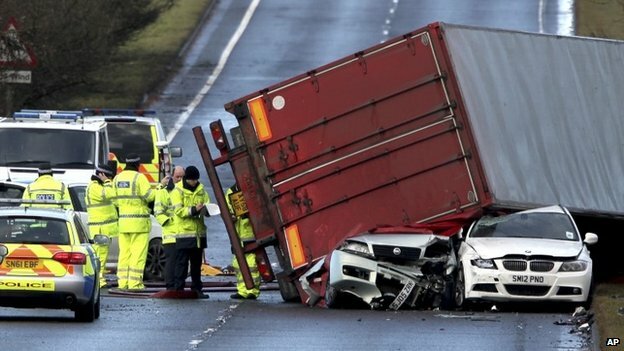 Winds of up to 228 km/h (142 mph) battered Scotland, where a lorry driver was killed when his vehicle was blown over near Edinburgh. At least two other people were injured by falling trees. Police have confirmed reports that a man has been killed by a falling tree in Nottinghamshire, central England. 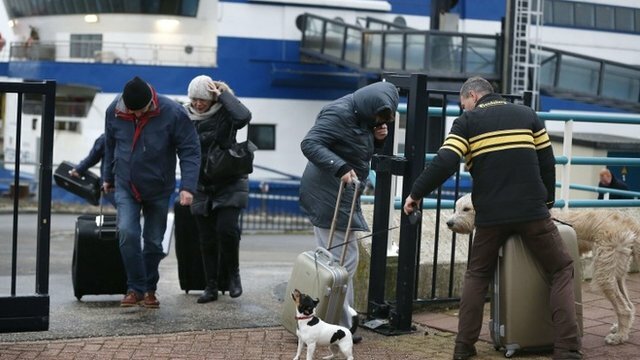 The storm has affected people across northern Europe, including Rotterdam where those venturing outside received a buffeting. In Scotland, a lorry driver was killed when his vehicle blew over. Preparations for a tidal surge are going on across several countries. Here, firefighters fortify an embankment in Cuxhaven-Sahlenburg, northern Germany. Two sailors were reportedly swept overboard from a ship 22 km (14 miles) off the southern Swedish coast, and air-sea rescue services failed to find them. A storm surge is due later on Thursday, coinciding with high tides in many areas. Britain’s Environment Agency said tidal surges could bring significant coastal flooding, and the Thames Barrier was being closed to protect London. 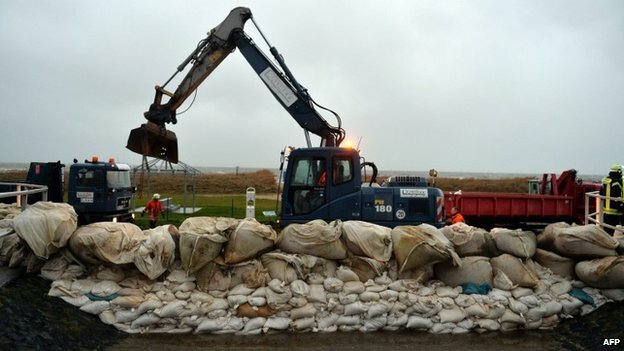 British authorities said they had evacuated homes in Great Yarmouth, eastern England, adding that it could be the biggest storm surge for 60 years. In the low-lying Netherlands, the Eastern Scheldt storm surge barrier has been closed off for the first time in six years. Dutch authorities said they had issued the highest possible flood warning for four areas in the north and north-west of the country. Germany reinforced emergency services in and around the northern port of Hamburg and cancelled lessons at several schools. 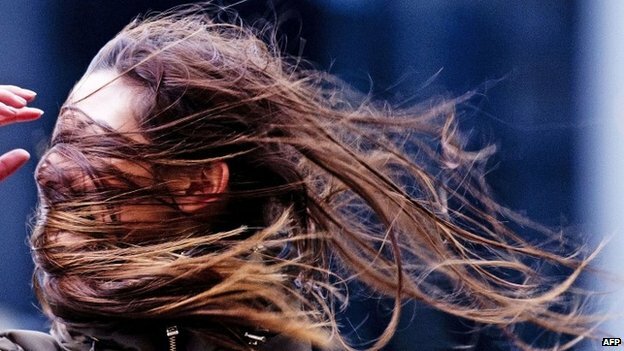 The storm was causing transport chaos throughout northern Europe. Dutch airline KLM cancelled 84 flights from Amsterdam’s Schiphol airport, while about 20 were cancelled at Hamburg airport. Flights from Glasgow, Edinburgh and Aberdeen airports in Scotland were also cancelled. Rail travel was badly affected, with all train services in Scotland cancelled because of debris on the lines and damage to equipment, and services in northern England were also hit. The Oeresund road and rail bridge between Sweden and Denmark – which links the Danish capital Copenhagen with the Swedish city of Malmo and features in the hit television series The Bridge – was due to close from 1500 GMT. Railway lines in Sweden and Denmark were closed, while Germany’s national railway, Deutsche Bahn, warned of likely disruption across a swathe of northern Germany. Ferries to Germany from Sweden and Denmark were cancelled. The entire nation of The Netherlands celebrated the seventieth birthday of Abraham Kuyper on this day, October 29, 1907. By proclamation the nation recognized that the history of the Netherlands, in Church, in State, in Society, in Press, in School, and in the Sciences the last forty years, could not be written without the mention of his name on almost every page, for during this period the biography of Dr. Abraham Kuyper was to a considerable extent the history of the Netherlands.Who was this man who had such a deep impact on his nation? 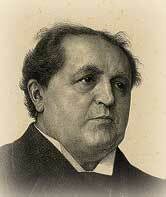 Abraham Kuyper was born on this day, October 29, 1837. At first his teachers thought he was dull, but at the early age of twelve he entered the Gymnasium (roughly equivalent to an american senior high school). Later he graduated with highest honors from Leyden University. He went on to receive his doctorate in sacred theology and was a minister at Breesd and Utrecht before going to Amsterdam in 1870. In Kuyper’s earlier years, the religious life of the nation was almost dead. The church was largely cold and formal. There was no Bible in the schools and it had minimal influence in the life of the nation. Kuyper did much to change this by his involvement in the Anti-Revolutionary Party. The Anti-Revolutionary Party derived its name from its opposition to the ideas of the French Revolution; the party was basically the Protestant contingent of the Dutch nation. In 1872 Abraham became Editor-in-chief of De Standard, the daily newspaper and official organ of the Anti-Revolutionary Party. Soon after taking the helm of De Standard, Kuyper also became editor of De Heraut, a weekly Christian newspaper. He continued as editor of both newspapers for over forty-five years. In 1874 Kuyper was elected to the lower house of Parliament, and he served there until 1877. Three years later he founded the Free University of Amsterdam, which took the Bible as the foundation of every area of knowledge. As leader of the Anti-Revolutionary Party, Abraham was summoned by Queen Wilhelmena to form a cabinet and become Prime Minister of the nation. He was Prime Minister until 1905. Some party members were dissatisfied with their leader, however, because he would not keep his church and political activities separate. To him, they were identical interests since he saw Christ as king in every department of human life. Abraham believed that Christ rules not merely by the tradition of what He once was, spoke, did and endured, but by a living power which even now, seated as He is at the right hand of God, He exercises over lands, nations, generations, families, and individuals. Abraham Kuyper had a tremendous aversion to wasting time when there was so much to do. A man of tremendous versatility, he was a noted linguist, theologian, university professor, politician, statesman, philosopher, scientist, and philanthropist. In spite of his many accomplishments and his tremendous urgency to redeem the time, Abraham was also a man of the people. Like the Savior whom he served, he always had time for people and never turned any away who needed his counsel. That in spite of all worldly opposition, God’s holy ordinances shall be established again in the home, in the school, and in the State for the good of the people; to carve as it were into the conscience of the nation the ordinances of the Lord, to which Bible and Creation bear witness, until the nation pays homage again to God. The fellowship of being near unto God must become reality, in the full and vigorous prosecution of our life. It must permeate and give color to our feeling, our perception, our sensations, our thinking, our imagining, our willing, our acting, our speaking. It must not stand as a foreign factor in our life, but it must be the passion that breathes throughout our whole existence. Gordon, Ernest. A Book of Protestant Saints. Chicago: Moody Press, 1946. Kuyper, Abraham. To Be Near Unto God. Grand Rapids: Baker, 1979. McGoldrick, James E. Abraham Kuyper; God’s Renaissance man. Auburn MA: Evangelical Press, 2000.